David Carlson, the owner of Three Tides in Belfast, poured a Sea Level Stout before the bar's opening party on St. Patrick's Day in this March 2012 file photo. BELFAST, Maine — The beers on tap at Three Tides & Marshall Wharf Brewing Co. on the Belfast waterfront are creative, delicious and brewed with ingredients as diverse as coffee, chile peppers and oysters. They can also be quite strong, with the alcohol by volume content of the beers ranging from 3 percent to 11 percent, or stronger than some wines. Proprietor David Carlson tries to keep customers informed of how much alcohol they’re consuming by clearly posting the alcohol by volume numbers on the menus and chalkboards of the popular bar. But he was surprised a few days ago to learn from the Liquor Licensing and Compliance Division of the Maine State Police Department of Public Safety that he will have to take those numbers down, in accordance with an old state law governing alcohol sales. Carlson wrote a Facebook post about the old law on the brew pub’s page on Thursday, and by Saturday morning, it had received 117 comments and been shared nearly 40 times. So far his plea has reached the ears of several lawmakers, including Rep. Louie Luchini, D-Ellsworth, the co-chair of the Veterans and Legal Affairs committee, which deals with matters of alcohol sales. He said Friday that earlier that day he had submitted a bill request in an effort to quickly resolve the legal problem. He hopes it’s something that can be cleared up soon. Because it is the Maine Legislature’s second regular session, the bill must be submitted as emergency legislation and first be approved by the Legislative Council. If accepted by the council, the bill would require a two-thirds vote in both the Maine State Senate and the Maine State House of Representatives to pass. Carlson, who was not issued a citation for posting the alcohol content on his menus and chalkboard, said that his servers will have to brush up on their knowledge of his beers’ strength because they will still be allowed to tell customers that information verbally. In general, Maine lawmakers and liquor inspectors have tended to work cooperatively rather than punitively with brewers and bars, according to Carlson and Gene Beck, the owner of Bangor’s Nocturnem Draft Haus. “Regarding blue laws — they’re not frequent, but when they come up, they’re legally complex,” Beck said. 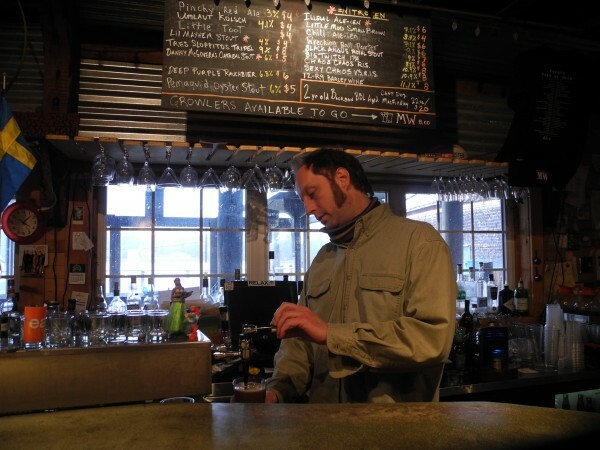 Last year, he worked with Rep. John Schneck, D-Bangor, to change the law that previously had mandated that bars must have handles on beer taps that label the available beers. With craft beer bars that rotate taps and have an ever-changing menu of brews available, the tap labeling law had become both meaningless and expensive, Beck said.